The OAKVILLE PLAYERS choice of the Finn/Walton comedy “GAME SHOW” is a bit of a gamble. 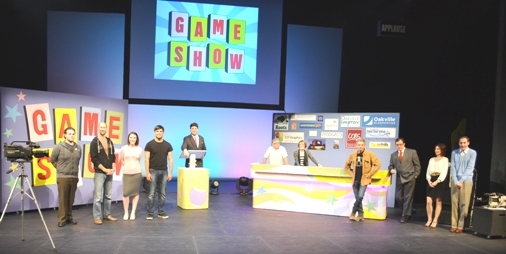 Game Show is about a live TV game show and is presented as an actual game show with contestants randomly selected from the audience. What if no one volunteers? What if a selectee fails to get into the spirit of things? What if the audience sits on their hands when the [APPLAUSE] light flashes? Fortunately, none of the above happened last night! We last saw the play two years ago with Charles Shaughnessy as the Emcee/host (aka the much vexed NY producer from ‘The Nanny’). That production actually used functioning CCTV units and the memorable highlight was a projected shot of an audience-member picking her nose! Nothing of the kind happens with this rendering, but there is a lot more portable-mike excursions among the spectators. This directorial modification by Katherine Kormos adds an atmosphere of participation and reality to the event. Her pace is almost frenetic, just like an actual TV taping, (or so I recall from Hubby’s stint as a 300-second weekly segment on “MAIN STREET”). There are a few items surprisingly omitted; the most glaring – a lack of toothy smiles by the host. Outside of the missing Colgate™ choppers; Barnaby Clunie is an epitomic TV personality. His insecurity, relentless need of stroking; and peer envy coupled with a powerful on-air charisma all ring true. The warm-up comedian & Asst. Producer is dynamically portrayed by Mike Ranieri. His exuberance and audience exhortations are contagious and contribute in a considerable manner to the sense of participation needed in such a stage effort. He captures the status of being a ‘second banana’ with just the right amount of panache. The manipulative producer ‘Ellen’ (stage version; NOT Mary Rose) is played to the hilt by Shann McGrail who devious machinations are both comedic yet somewhat scary. Everyone who is or has been involved with business, politics or a volunteer organization will recognize an ‘Ellen’ whose agenda manifests itself in personal scheming & maneuvering. McGrail is a malicious delight. The play receives strong support from the camera duo of played by Armand Antony & Mark Christopherson. Not only do they supply some comedic sidebars but it‘s their shenanigans that bring about the denouement. The production assistant or ‘gofer’ role is exaggerated by Josh Stone whose sycophancy is overdone. We both were enthusiastic audience members, and admit to getting eleven of the thirty-odd questions posed to the contestants. In other words, “Game Show” is more Jeopardy® than ‘Wheel of Fortune’®. One can be part of a game show by seeing “Game Show” at the O.C.P.A. until Mar. 28th.